Law enforcement agencies from across the U.S. have reached out to Jalopnik for help with car identifications since your input was "critical" to solving a hit-and-run earlier this year. It was around 5:30 a.m. the Saturday of Thanksgiving weekend when 24-year-old Ivan Miranda's car collided with another vehicle in Chicago's Humboldt Park neighborhood. Along with two passengers, he was apparently en route to pick a sibling up from work, but that wouldn't happen. Wilmari Velez, who lives next to the Miranda family, said that she has known the Mirandas since she was in her early teens and grew close to the four brothers. Her 2-year-old daughter, she said, affectionately called Ivan Miranda "tio," Spanish for uncle. Velez said Ivan Miranda was a jokester who "always had a smile on his face." 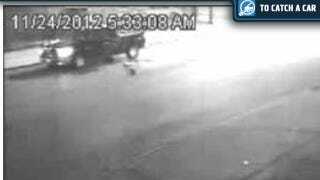 On Monday, the Chicago Police Department's Major Accident Investigation Unit released surveillance footage of a dark double-cab truck — possibly a Dodge or Nissan — in the hopes of identifying a driver who may have witnessed the crash. I just spoke with the Chicago PD, who were understandably too distracted by three officers getting injured when their car flipped over, oh, an hour ago to seek out a larger photo. So, we'll just have to make due with these two. The NBC affiliate has smaller versions on its site, as well. Do your thing, folks.